This chapter summaries some of the literature about alternative studies which have explored aspects of tolerance not as a function of absence of prejudice. 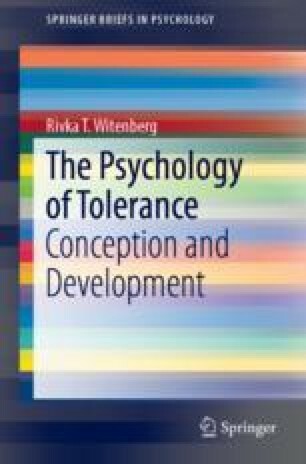 Psychological research about tolerance has focused on political and belief discrepancy tolerance rather than tolerance more generally. The reviewed studies are examples of a larger body of literature which endorses the idea that political and belief-discrepancy tolerance is not a global construct and that whom we are asked to tolerate, what we are asked to tolerate and under what circumstances we are willing to tolerate others influence how tolerant we are. Age and gender related differences were also evident with younger children inadequate in their abilities to deal with difference and diversity because of their cognitive limitations and insufficient knowledge base rather than pure prejudice.